Honda is launching a social campaign for the Clarity Electric sedan. The all-new 100% battery-powered, zero-emissions 2017 Clarity Electric sedan arrived to select Honda dealerships in California and Oregon last month. “While Honda fans outside of the sales region may see the content organically, the paid media behind the Clarity Electric is geo-targeted to the areas where the vehicle is sold, so most people who will see the content will be in the area where they can purchase the vehicle,” says Jessica Fini, social media manager, American Honda. The campaign includes a long-form “ABCs of Clarity” video, which debuted Friday. 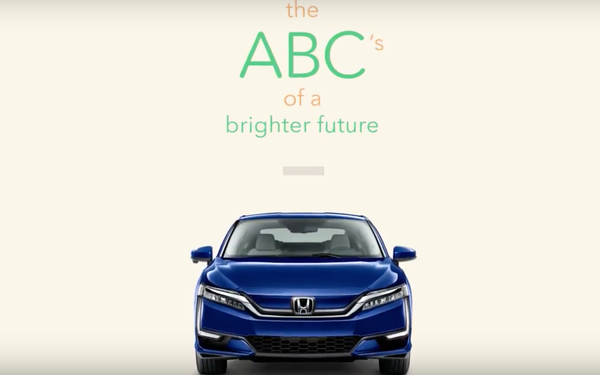 Honda worked with AOR RPA on the effort, which also features individual creative pieces for all 26 letters of the alphabet to highlight benefits of driving Clarity Electric, fun facts about electric vehicles and tips for living a more environmentally conscious lifestyle. A total of 26 unique, 7-second videos were released over the past few months on Honda’s Facebook, Instagram, Twitter and YouTube channels. All videos have been designed for mobile, with vertical content and text overlays to further engage audiences, while conveying key vehicle benefits, Fini tells Marketing Daily. The long-form film features a variety of creative styles including traditional animation, stop motion and 3D animation. For fans to see all 26 videos in one place, Honda also set up a campaign-specific Instagram account. Examples from the campaign include “A is for all of us adoring our atmosphere” to celebrate the Clarity’s zero tailpipe emissions and “B is for bees bringing blooms to the biosphere,” to illustrate the need to be aware of all those living in our ecosphere. Additionally, letters calling out the benefits of a Clarity Electric include “C is for carpooling with your co-worker crew” and “L is for luxurious legroom” are also a part of the 26-letter campaign. In addition, Honda will upload the full audio version of “The ABC’s of a Brighter Future” song to SoundCloud. To bring a more localized feel to the campaign, Honda worked with three creative influencers in Los Angeles, San Francisco and Portland, Ore., to highlight city-specific benefits of driving a Clarity Electric and living a more environmentally conscious lifestyle. DABS MYLA in Los Angeles, Oh Happy Day in San Francisco and Haley Devine in Portland will release their own 7-second videos in support of the campaign on their Instagram channels along with Honda’s Facebook and Instagram pages. The Honda Clarity Electric stands out in that it is “incredibly roomy, tech-loaded while affordable, fitting five passengers comfortably with trunk space on par with a full-sized sedan, and is also full of standard advanced safety and technology features,” Fini says.